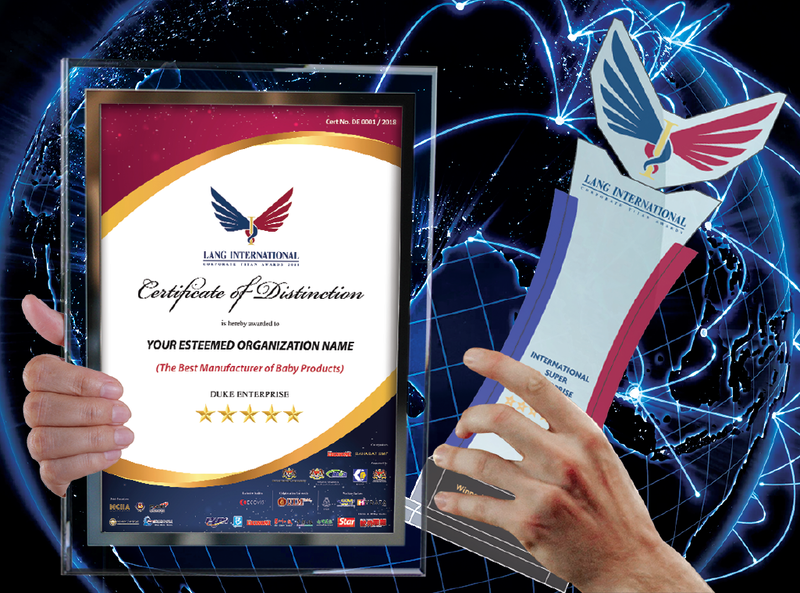 A crystal trophy and a Certificate of Distinction (the winner's area of expertise will be specified), presented by Minister/MB/CM or equivalent during Gala Dinner. An acrylic plaque indicating the winner is 'Outstanding-Genuine-Trustworthy'. Networking session with all attendee during Gala Dinner. A photography taken with award presenter. Interview session by famous TV or Radio host. Privileged Media Coverage (online and offline media), various advertising and promotion activities (e.g. official portal, Facebook, Youtube, official catalogue, newspapers, magazines and etc). Authorized to use The Awards' logo for two consecutive years as their corporate collaterals for advertising and promotion purposes. Become a part of “Lang International Corporate Titan Awards” Alumni and gain invitation to join the prestigious club membership at a special discounted rate. Participation in the future resource integration sessions with local and overseas winners, business tycoons, government bodies, government-linked companies, etc. The Secretariat may act as the intermediary or information centre for overseas winners in the event who want to expand their business in Malaysia.